C1419. PIERRE MONTEUX Cond. Boston S.O. : Le Sacre du Printemps (Stravinsky). 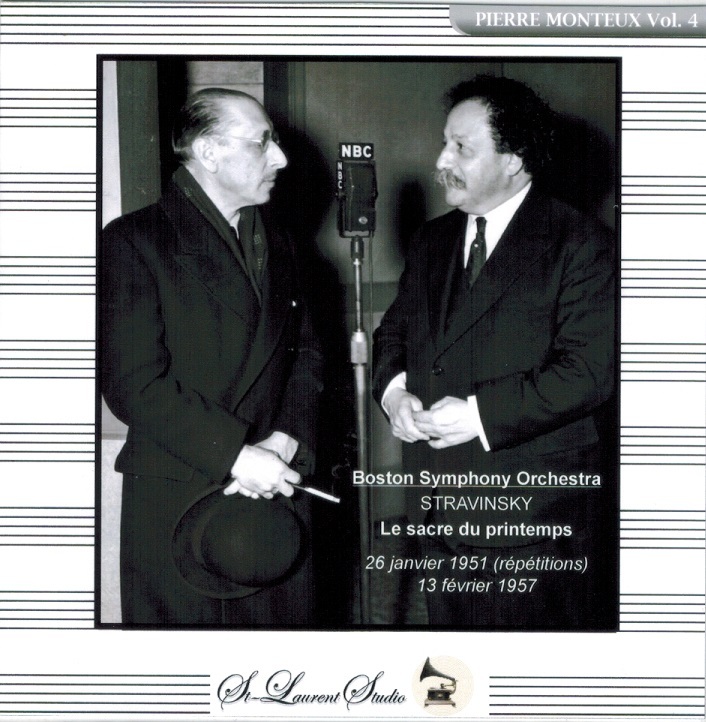 (Canada) St Laurent Studio YSL T-326, Live Performance, 11 Feb., 1957, Symphony Hall, Boston, plus one half-hour of rehearsal segments for this performance, replete with Monteux's delicious and charming 'FrEnglish, as introduced by NBC radio commentator Ben Grauer. [This fabulous live performance benefits greatly by the glory of the Symphony Hall acoustic.] Transfers by Yves St Laurent. "Pierre Monteux conducted the infamous first performance of LE SACRE DU PRINTEMPS. The BSO players seem to be playing on the edge of their seats with commitment. Over the years, LE SACRE (The Rite of Spring) of 1913 has remained Stravinsky's best known work. This is due, in part, to the fact that in addition to its musical uniqueness, LE SACRE serves as a virtual compendium of the early twentieth century music vocabulary. More specifically, as a result of the work's seemingly unromantic, asymmetrical, and violent nature, LE SACRE DU PRINTEMPS is often classified as the prime example of musical primitivism. Monteux served as principal violist in the Opera-Comique and was also assistant conductor and concertmaster of the Concerts Colonne. In 1894 he joined the Quatuor Geloso as a violist and was privileged to participate in the performance of a Brahms quartet in the composer's presence. In 1908 he became conductor of the Orchestre du Casino in Dieppe and in 1911 founded a series called the Concerts Berlioz. In the same year, he began an historic association when he was hired by Diaghilev to conduct his Ballets Russes. He led the premieres of Ravel's DAPHNIS ET CHLOE, Debussy's JEUX, and Stravinsky's PETRUSHKA and LE SACRE DU PRINTEMPS, the last of which caused a notorious audience riot. In 1914, when war broke out, he was called to military service. He received a discharge in 1916 and travelled to the United States, where he obtained a conducting post at the Metropolitan Opera that lasted until 1919. At that point he was engaged to conduct the Boston Symphony Orchestra. Taking up the post in 1920, he walked into a labor dispute, with his musicians on strike; by the time the strike was settled, the concertmaster and 30 other musicians had left. Monteux had to rebuild the orchestra - a difficult task, but an opportunity for Monteux to mold the orchestra according to his own taste. 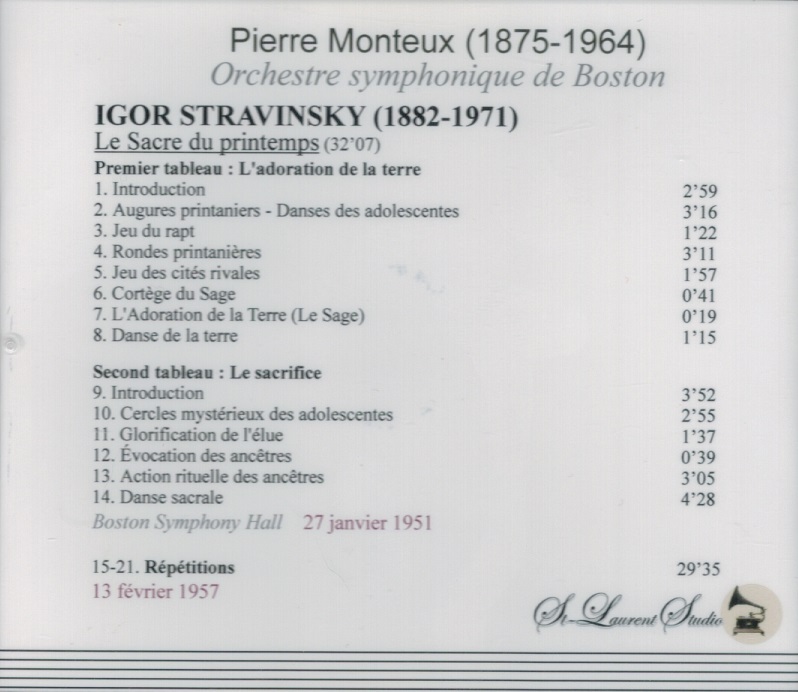 Ever since then, the Boston Symphony Orchestra has been known for its French sound and its expertise in French and Russian repertoire. He remained in Boston through 1924, gaining a reputation as a supporter of modern music. He brought to America not only Stravinsky and the French composers, but such others as Respighi, Vaughan Williams, and Honegger." “LE SACRE's première took place at the Théâtre des Champs-Elysées on 29 May, 1913. It is arguably the most famous debacle in western artistic history. Audience members found the quiet, yet active, introduction ridiculous. When the curtain rose and Nijinsky's dances began, the auditorium went into a rage, their sophistication insulted. Ravel and Debussy were both present and captivated by the music, but it was soon drowned out in the fracas. Debris was thrown, as well as punches. The work was performed in full, but only with the help of Nijinsky calling steps from atop an offstage chair. LE SACRE was staged in London that July and coldly received, albeit undisturbed. 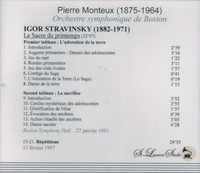 Negative reactions would still come ten years later, when Monteux [again]conducted LE SACRE with the Boston Symphony Orchestra in 1924. Yet as modernism slowly sank into western culture and the realities of grand-scale warfare emerged, LE SACRE became recognized for its contribution to the modern artistic temperament. As Carl Van Vechten, drama critic for the New York Sun later wrote,'...the unruly audience became as much a part of the performance as the dancers and musicians: Some forty of the protestants were forced out of the theater but that did not quell the disturbance. The lights in the auditorium were fully turned on but the noise continued and I remember Mlle. Piltz [the dancer portraying the sacrificial maiden] executing her strange dance of religious hysteria on a stage dimmed by the blazing light in the auditorium, seemingly to the accompaniment of the disjointed ravings of a mob of angry men and women. The subsequent coverage in the press of the ballet—which is now considered one of the great musical achievements of the 20th century—was resoundingly negative; the music was dismissed as mere noise and the dance as an ugly parody of traditional ballet'. “Some of those in attendance to see the Ballets Russes at the Théâtre des Champs-élysées on 29 May, 1913, would already have been familiar with the young Russian composer Igor Stravinsky through his 1910 ballet L’OISEAU DE FEU (The Firebird). But if they expected his newest work to proceed in the same familiar and pleasing vein as his first, they were in for a surprise. From the moment the premiere performance of Stravinsky’s LE SACRE DU PRINTEMPS (Rite of Spring) began on this night in 1913, it was clear that even an audience of sophisticated Parisians was totally unprepared for something so avant-garde. From the first notes of the overture, sounded by a bassoon playing well outside its normal register, Stravinsky’s haunting music set the audience on edge. It was the combination of that music with the jarring choreography of the great Vaslav Nijinsky, however, that caused the uproar that followed. ‘The curtain rose on a group of knock-kneed and long-braided Lolitas jumping up and down’, Stravinsky later remarked of the brutal opening seen of LE SACRE DU PRINTEMPS, which depicts a virgin sacrifice in an ancient pagan Russia. Catcalls began to issue from the audience as they took in the bizarre scene playing out before them. The noise became great enough that the orchestra could not be heard from the stage, causing Nijinsky to climb atop a chair in the wings shouting out instructions to his dancers onstage. While Stravinsky sat fuming as his music was drowned out by jeers, whistles and—if one witness is to be believed—members of the audience barking like dogs, Serge Diaghelev, impresario of the Ballets Russes, frantically switched the house lights on and off in a futile effort to restore order. It was, in other words a scene that bore a closer resemblance to the Marx Brothers’ A NIGHT AT THE OPERA than it did to a typical night at the Ballets Russes.